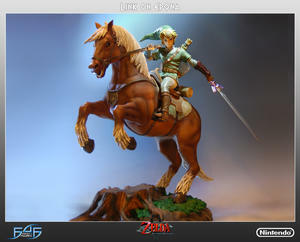 The Legend of Zelda Twilight Princess "Master Arts" Link on Epona Centerpiece. 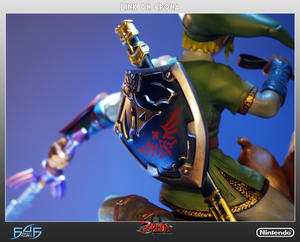 First 4 Figures is hugely proud to present Link on Epona, the third in our "Master Arts" line of Twilight Princess Centerpieces. In order to help fight the evil forces of Ganondorf, Link can summon his faithful horse, Epona if he uses a special kind of grass called Horse Grass to play "Epona's Song". She is named after Epona, the Celtic goddess of horses, whose name and worship spread throughout the Celtic and Roman worlds. In the final battle against Ganondorf, Link along with Princess Zelda, must ride on Epona to fight him, leading to the final showdown. Link is riding on Epona, who is rearing back on her hind legs, ready to battle evil that stands in his way on his quest to free the Twilight Princess. Each piece is individually painted and finished to exacting standards. They are an amazing addition to your Zelda display. They measures approximately 17 inches tall and 16 inches long. Cast in high quality poly-stone, the statue is hand finished and hand painted. 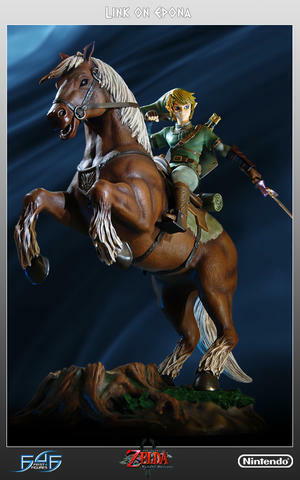 We faithfully recreated the style and feel of Link on Epona, packing the statue full of detail like the others in the "Master Arts" range. They comes in deluxe full color packaging, hand numbered base, and includes an Authenticity Card. Highly Limited to 1500 pieces only worldwide.